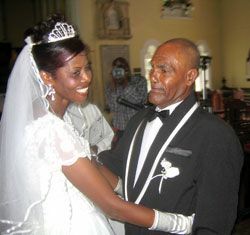 It was âJoy, Joy down in my heart, down in my heart to stayâ for security guard,Clifton âBig Combâ Baptiste as he swore before God and man to love and to cherish,to have and to hold and keep under tight security his beautiful wife,Joy Cynthia Richards.The newly weds took their vows on Saturday, November 17, 2007 at the St. Georgeâs Cathedral, Kingstown in a very simple but touching ceremony officiated by the Rev. Dean Patrick Mc Intosh,and witnessed by their paremts, relatives and close friends. From the church the Bridal Party journeyed to Sugar Mill for a grand ceremony.